Yay, I have finally unravelled the identify of this stunning beauty! How wonderful to be able to name it after almost 4 years since it was last sighted at our backyard in January 24, 2004. And, to know that this was a handsome male moth and learn so much more about it. Sad though, to read that an adult Atlas moth can live only for about two weeks. They do not eat at all throughout their adult life, do not even have mouths and live off fat reserves built up when they were caterpillars. They quickly mate, lay eggs, and die shortly thereafter. I can still vividly recall how amazed and enthralled we were to see such a huge moth on the black netting fixed at the awning extended above our backyard! A first time for my beloved spouse and I, we’ve never seen such a mammoth one before and so beautifully patterned. And, definitely a must to capture. So, my hubby ran in to get the 5-steps aluminium ladder and I went in to get the camera, and in a jiffy my hubby climbed up the ladder to capture 5 shots before the moth sensed our presence and flew away! How awesome to be blessed with such an amazing visitor! 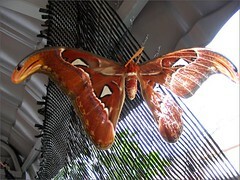 The Atlas moth is considered to be the largest moth in the world in terms of total wing surface area. It is thus named because of its wing patterns that resemble maps. Its wingspan is also amongst the largest, from 25-30 cm (10-12 inches). The wing tips are hooked and slightly resemble a snake’s head complete with an eye. It is predominantly tawny to maroon in colour with large triangular eyespots on both forewings and hindwings to scare off predators. Its hairy body is disproportionately small compared to its wings. A male Atlas moth is differentiated from a female by its smaller size, more tapered wings, and large bushier antennae. Read and enjoy more at Wikipedia and Autumn Belle’s Nice Garden. World Distribution: Tropical and subtropical forests of Asia and Southeast Asia. Wow, Jacqueline, I can’t wait for this moth to visit my garden too! I will insert your link in my post. It can fly quite high. Hope this great beauty will grant your wish, A. Belle! Thanks for link… will reciprocate with yours in our post too. Jacqueline, thank you very much for inserting my link in your popular website! I would like to inform you that I have inserted a photo a pair of mating atlas moths. You’re most welcome and the pleasure is all mine, A. Belle! Thanks for notifying me… will visit you shortly!